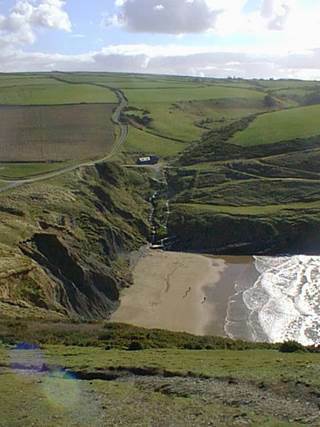 Burgh Island is just off Bigbury on Sea in South Devon. 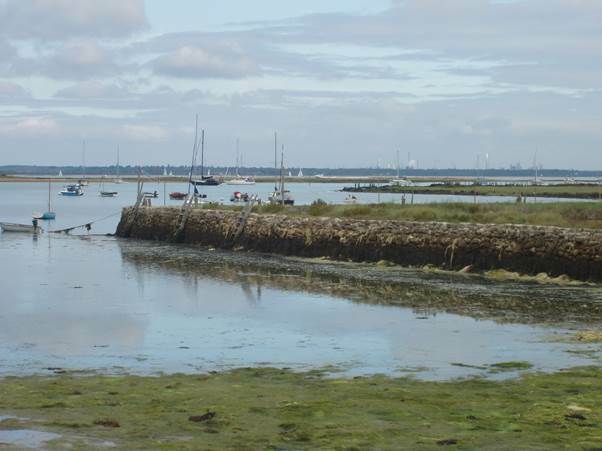 For much of the day it is joined to the mainland by a sandy causeway but at high tide the island is quite separate and special transport is needed to make the crossing. 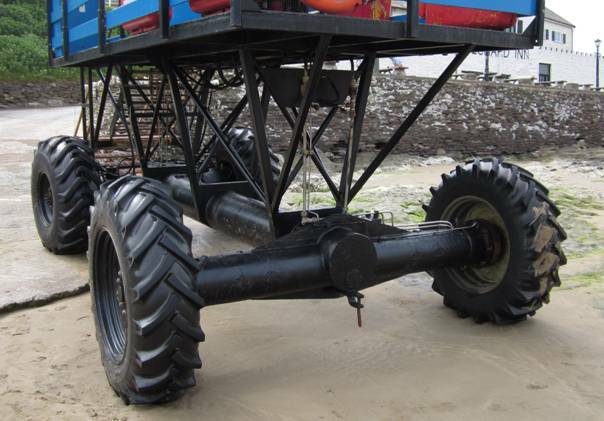 There probably isn’t much depth of water or a boat could be used with ease. Instead wheeled transport is used. This is it. 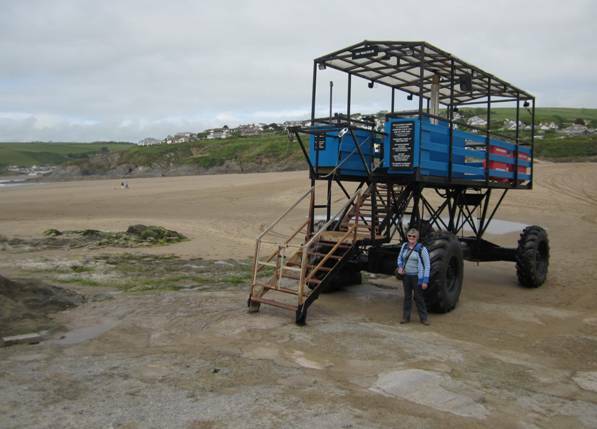 The transport is here on the Burgh Island side and at the time of this visit (June 2013) it wasn’t needed because the sand was dry enough and firm enough to allow ordinary vehicles across. Indeed, I had just walked across. This view shows just under half of the broad causeway that was available at low tide. This looks from the high point on Burgh Island, back across to Bigbury. But back to that amazing vehicle. Now I’m no expert but it looks to me as though this vehicle has hydraulic transmission driven by a motor on the passenger deck. 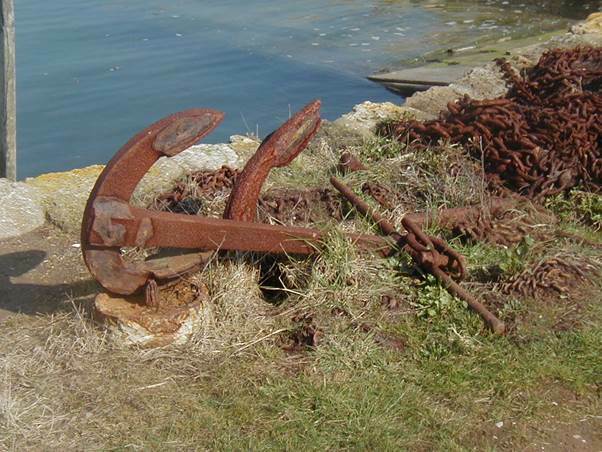 I can’t really imagine how the rusting effect of salty water is managed. It clearly is for this, the third version to be built, has been in use since 1969. Here’s another view, this time from the Pilchard Inn which we saw in a previous picture. And finally, some scale, offered by my wife. 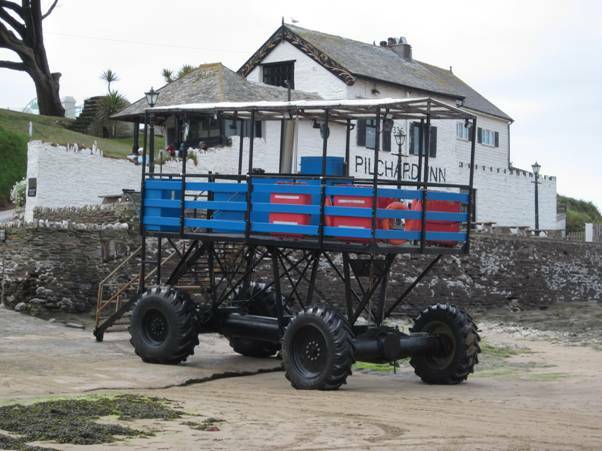 It is quite a substantial vehicle – and very quirky. Of course, I didn’t see it in action. If you want to see really scary action then try this youtube film – http://www.youtube.com/watch?v=N1BzsIxmq4Y. That’s a couple of loves today – both the Isle of Wight and a train. My photo dates from 1973 which was, frighteningly, now 40 years ago. The Island railways had been ‘rationalised’ in the mid-60s. 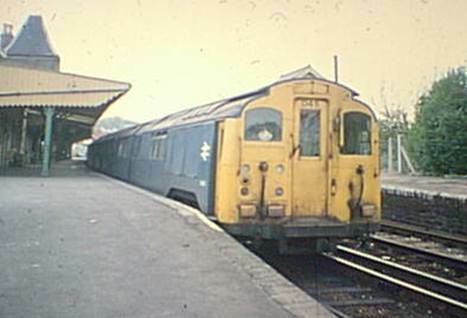 Only one stub of line remained – the one from Ryde to Shanklin. In the new world of British Rail a new system had to be found for the island. But there was a snag in that clearances for coaches were more limited than elsewhere. The line needed special stock. 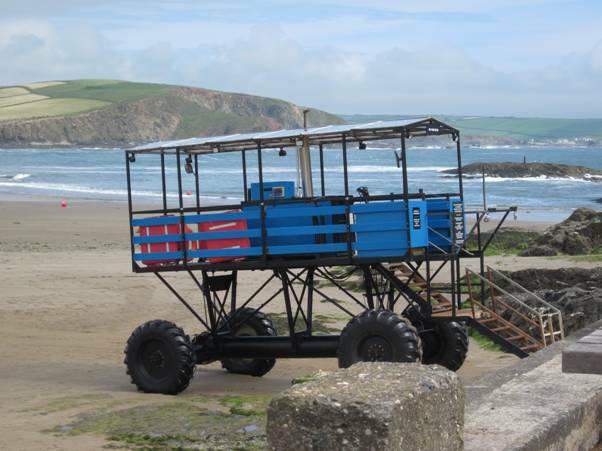 Well, British Rail was not going to order and get special trains so they came up with a novel solution. Old London tube trains were the answer and the Island Line was electrified to allow them to operate. The tube trains were old. They dated from the 1920s. I remembered them operating the Piccadilly Line in the early 60s. The trains were made up into 4 coach sets known as 4 Vec and 3 coach sets known as 3 Tis. Full length, 7 coach trains thus became Vectis – the Roman name for the island. Enough chat – here’s a photo taken on that old Canon Demi camera. I never thought British Rail blue with hi-vis yellow ends suited these trains. But they trundled along for quite a few years. Actually, they’d have been well timed in the 1950s for they were real rock and roll trains. In case that confuses, I refer to the way they travelled. I believe they have been replaced at least twice. One time I travelled the line – in the 1980s and there were some 1938 underground trains coming in to service. The last I remember were 1960s trains but they may well have been replaced by now. At least the line is alive and well and has even had new stations added along its length. What a pity the line no longer goes to Ventnor though. And it’s such a shame trains no longer reach Newport or Cowes. Ah! 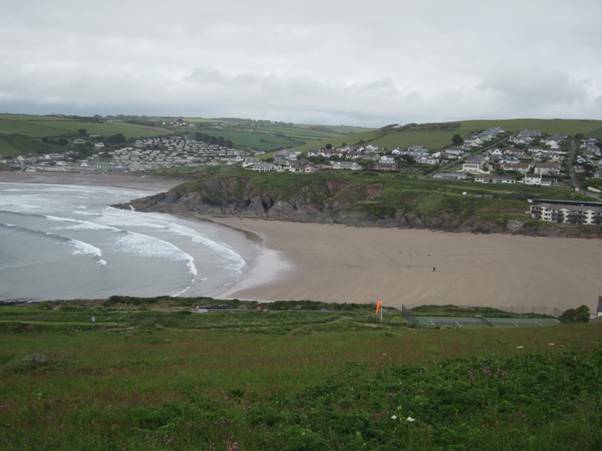 The beaches of West Wales! 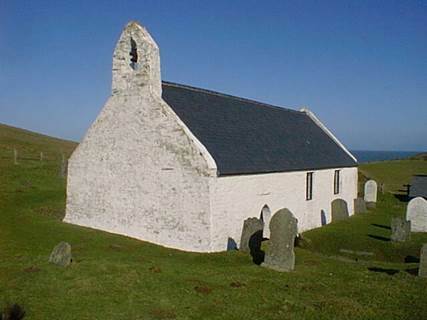 There are some lovely spots and Mwnt must be something of a favourite. It is a few miles north of Cardigan. There’s the little beach, way down below. This was on a quiet day in February 2000 and I was using my first digital camera which, on high quality managed 640 by 480 pixels which is something under a third of a megapixel. 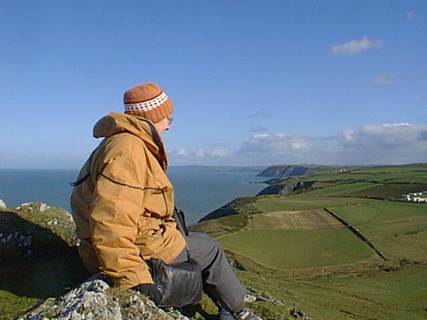 There were great views up the coast on a glorious day. 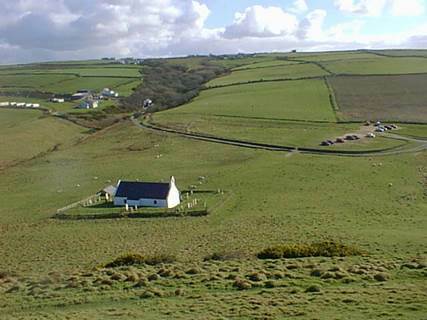 Mwnt chapel appears to serve a car park and a small caravan site. Now how delightful is that? The beach is grand. Someone has written ‘I am 22’ in the sand which reminded us of an earlier visit one Easter time. 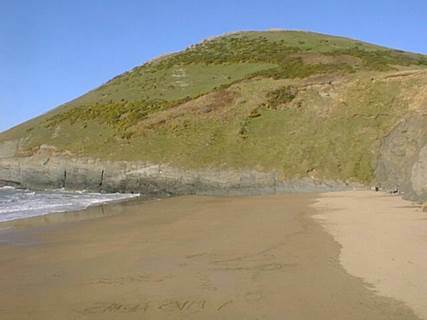 We wrote a huge ‘APRIL FOOL’ in the sand and were delighted to see the incoming tide wash it away almost spot on midday. We realised our mistake when we turned on our radio the next morning to hear the news. The announcement told us that it was April 1st. So we had been true April Fools by being a day too early. 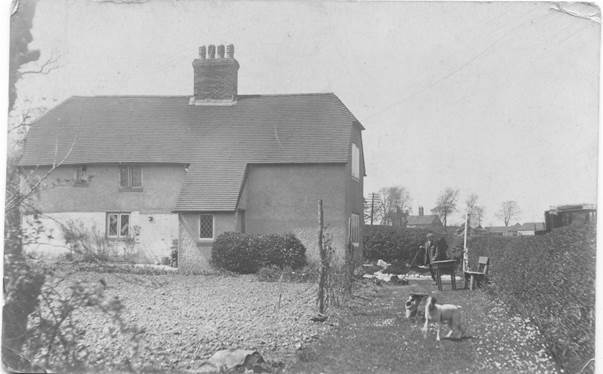 I was born in a fabulous old cottage near Wadhurst in East Sussex but at the age of 10 months my family moved to a rather more prosaic establishment at Ifield in West Sussex. During my 1950s childhood Ifield became a part of the New Town of Crawley, but old Ifield survived and here we see some photos I took in 2009. 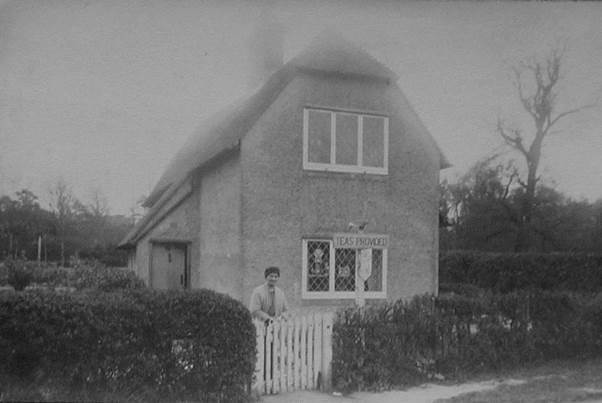 Just across the road from the old homestead was the village shop. It is still there and running as a shop which seems almost amazing in this day and age. There are many internal changes, but externally, it looks just right. 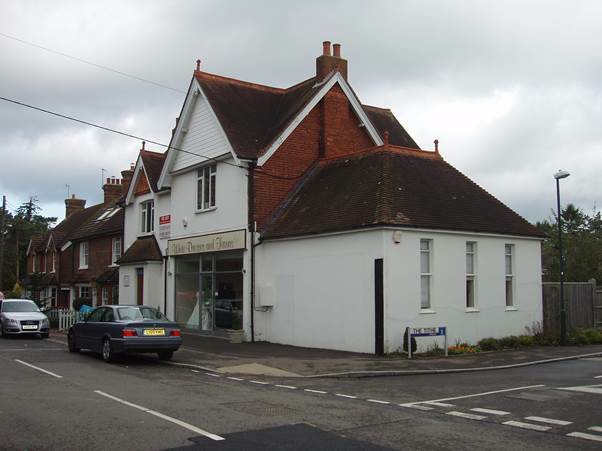 The petrol station has gone – but the building is still in use – in 2009 it was a wedding dress shop. There was no road called ‘The Tithe’ in my day. That was the works entrance to the little factory where (I think) ball bearings were made. 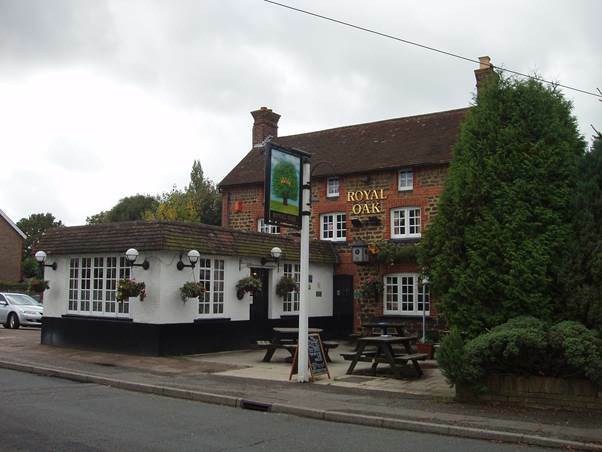 The local pub, The Royal Oak survives more or less unchanged as well although I have a memory of a tree where the picnic style tables are, with a circular seat built round it. Pubs were off limits in my family. They were seen as dens of iniquity. 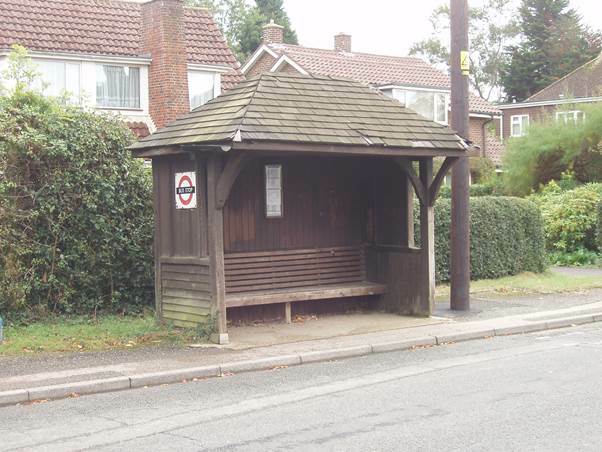 The bus stop – I remember the shelter being built – was opposite the pub. From there we had a choice of two bus services into Crawley. In early days one was Cumfy Coach service 33 which ran through villages from Horsham to Crawley. When London Transport took over the route it became service 852. 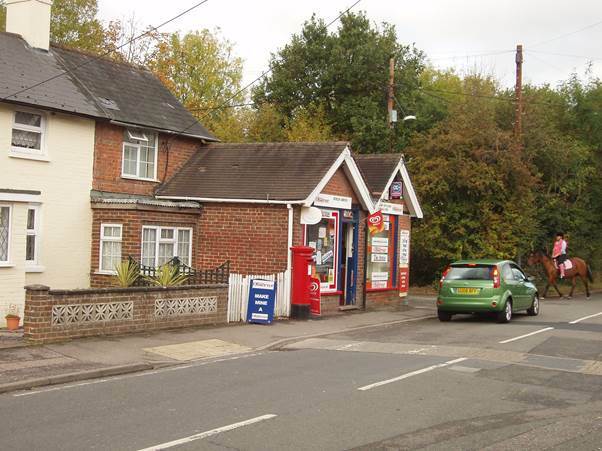 The other route went through villages from Horley to Crawley and was London Transport route 426. Buses on both services were old or interesting – but I didn’t take any photos. What facilities we had, all within 50 yards or so of our home. Perhaps some time I’ll look a bit further afield at modern Ifield. Ten years ago a new family member arrived. In the morning, I dealt with my animals and I could hear a cat yowling on the steep bank which goes down to a road. I didn’t think much of it, but in the evening, it was still there. I wondered if a cat had been injured on the road and needed attention. What was there was a rather wild and mangy kitten which I couldn’t catch. But my wife did. This kitten was a bit of a sorry sight, clearly not well and lousy with it. We’d guess that one of our own wonderful members of the human race had dumped it. Of course, we were instantly in love with the poor wee scrap. This was June 7th 2003. Next day it went to the vet who was honest in not holding out much hope. It had cat flu as well as the ‘crawlers’. I think it had a hernia as well. We spent our fortune – and the vet seemed to have a shrewd idea as to who might have dumped it. 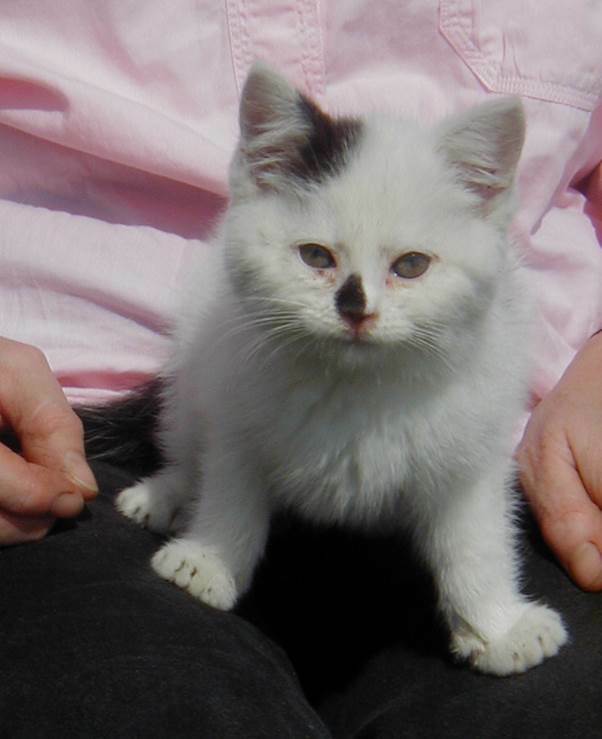 She was confident that nobody would ever claim their lost kitten – if it survived. Well daisy did survive. Three weeks later, she looked a happy cat about the house. There she was – bright eyed and she did have a bushy black tail. She went everywhere at top speed. We called her ‘the running cat’. 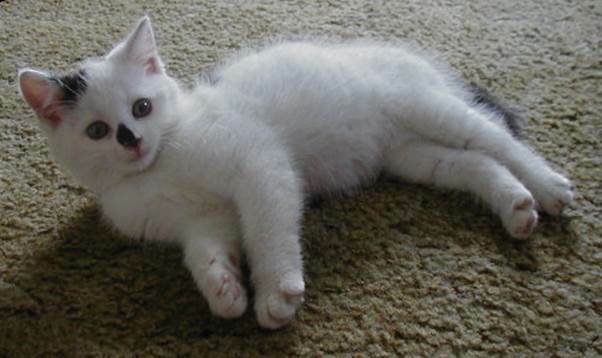 Daisy was a lovely cat but sadly her life was short. We had her for about 11 months. She didn’t come to a call and that was unusual. I found her body on the bank where we had first found her. It looked like she was running at full pelt. We don’t know why she died. It was near a road, but there was no sign of her having been hit. Perhaps it was a heart attack. Do you know it is ten days since I have mentioned railways. 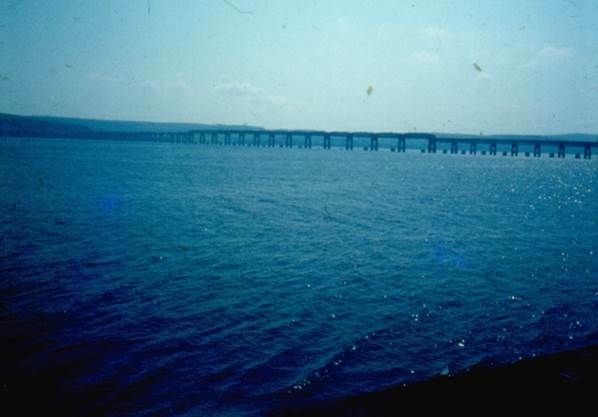 It must be time to put that right so let’s head up to Scotland and take a look at the Tay Bridge. We’ll start in 1970 and at Dundee. 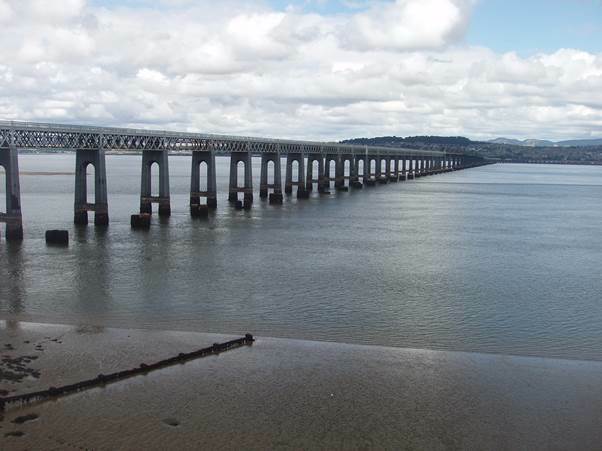 We can see the bridge curving across the Tay estuary, carrying the line south towards Edinburgh. The bridge is very long at some two and three quarter miles and (I speak as a bridge lover) it is not a lovely structure. 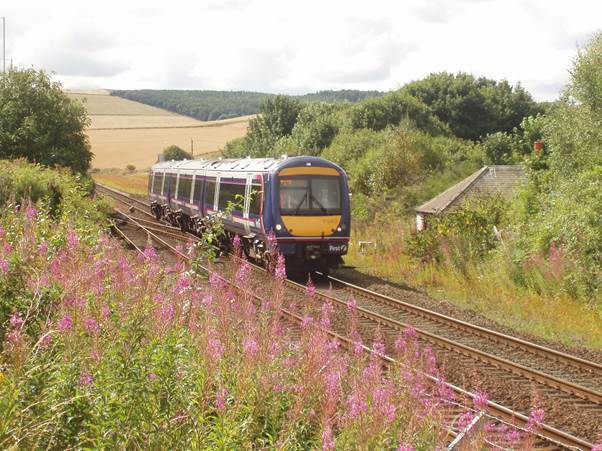 It is functional and does the job for which it was built which was to carry trains between Edinburgh, Dundee and the far north. It has done that job since 1887 with some refurbishment and strengthening. 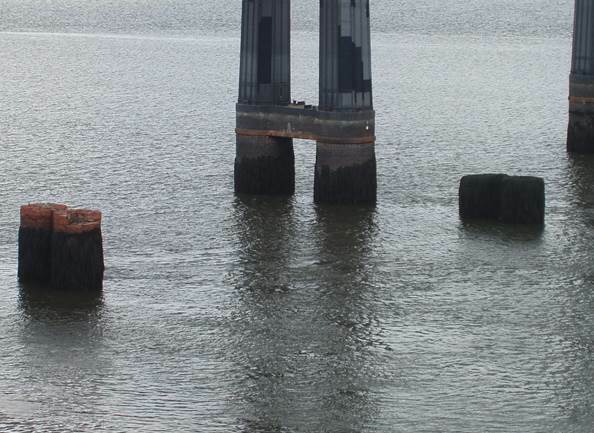 The observant will notice stumps between the piers of the existing bridge. They are the remains of the first bridge, which proved to be unequal to the task for which it was designed. That first bridge was opened on 1st June 1878. On 29th December 1879 a part of the bridge collapsed in very high winds. A train was washed into the icy waters below and all 75 passengers and crew were lost. Now we leap forward 35 years to August 10th 2005. We are now on the south side of the estuary at Wormit – pleasant scenery is the order of the area (with a railway line). That train is approaching the bridge. The bridge is still there of course, and so are those old bridge stumps. Now they are a bit spooky once you are reminded what happened here. But the train we are watching heads off over the bridge. There it goes, with Dundee across the water. 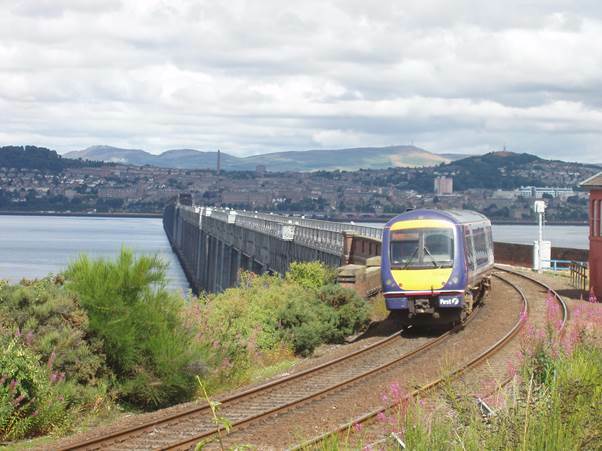 The highest distant hill immediately above the train is Craigowl Hill which rises some 455 metres above the waters of the Tay Estuary. On 29th May, 1956, Sammy Davis Junior recorded ‘Goodbye, So Long, I’m Gone’ I don’t think it was much of a hit on the UK side of the Atlantic. I don’t see it listed in my UK Hit Singles Book. However, the other side of the record, which was released in 1957, was a big hit with my son in the 1980s. 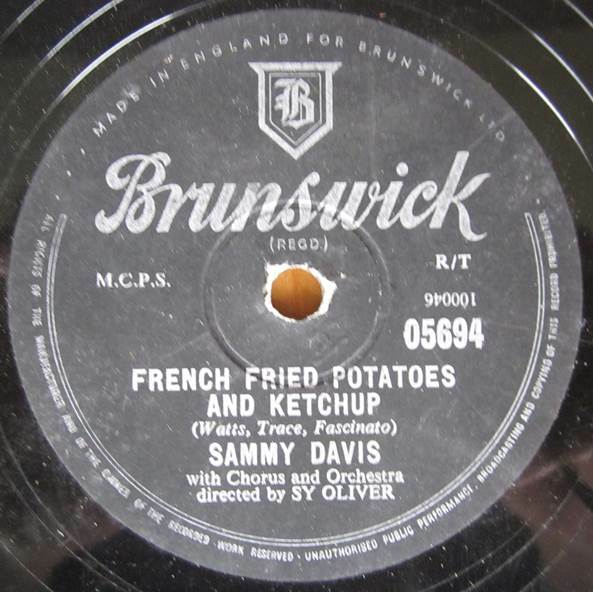 It’s a jolly sing-along number called ‘French Fried Potatoes and Ketchup’. It has quite a jazzy sax solo in the middle. 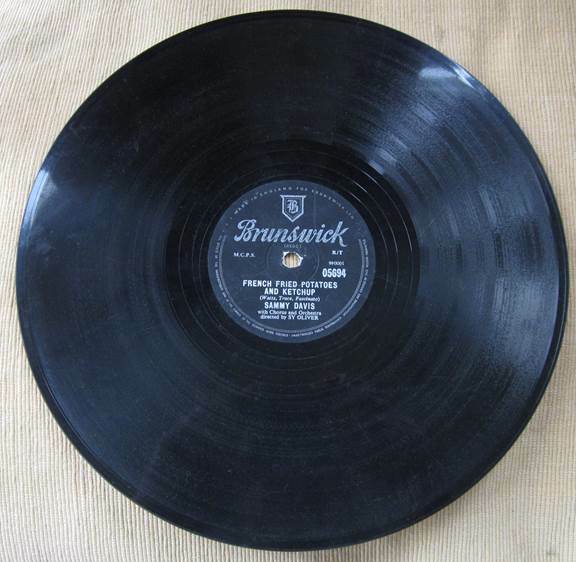 I have this record on a 78 rpm disc – the original, Brunswick, release. That’s quite a well-worn 10 inch diameter record. Eating French fried potatoes and ketchup. But it isn’t the food stuff for me – well OK I’m fond enough of chips. 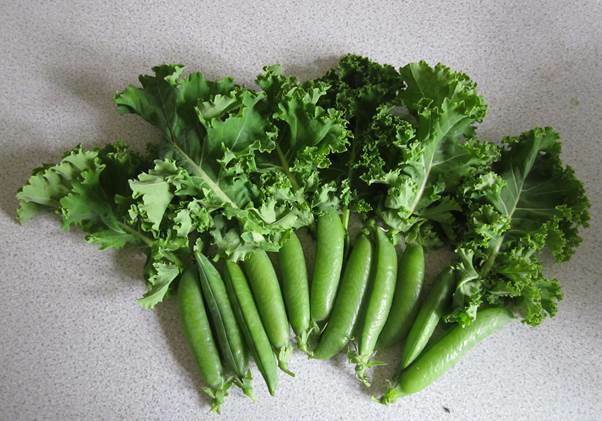 But I happen to have a wife who is a keen gardener and a keen cook so here we have more like my style. Now this is all food fit for a happy nerd. It has probably become clear – I love the Isle of Wight. A favourite place is Newtown. 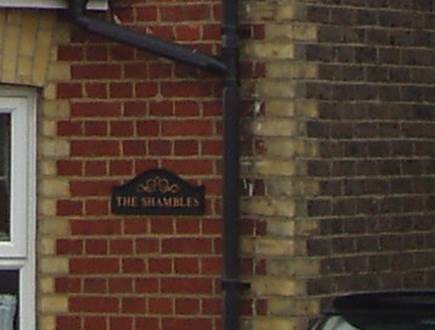 This little community is on the north coast of the island, between Cowes and Yarmouth. It is isolated from main routes although once it was an important town: important enough to have a substantial and delightful Town Hall. But as we see, of town there is not really a trace. 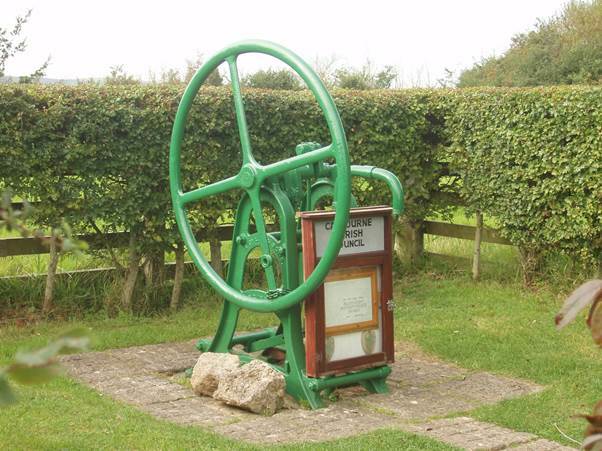 The area is now (I think) part of the parish of Calbourne which is why the preserved village pump carries that parish name. 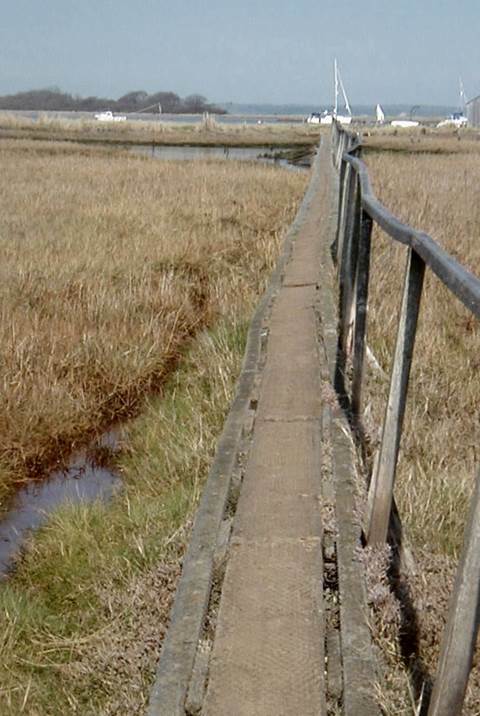 lead out to the estuary of the Newtown River. It’s a quiet haven, ideal for wading birds. In the view below you look across The Solent and the oil refinery at Fawley can be seen across the water. You can find the usual, fascinating, quayside junk. 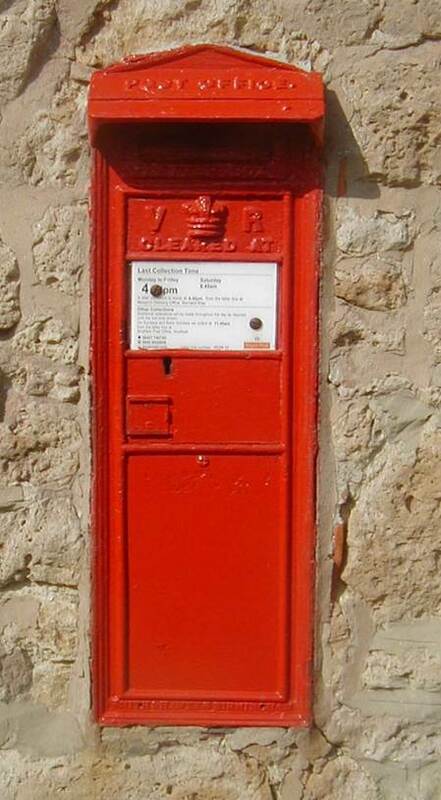 Before leaving Newtown, let’s take a peek at a great post-box – a real must for any UK post-box nerds out there. 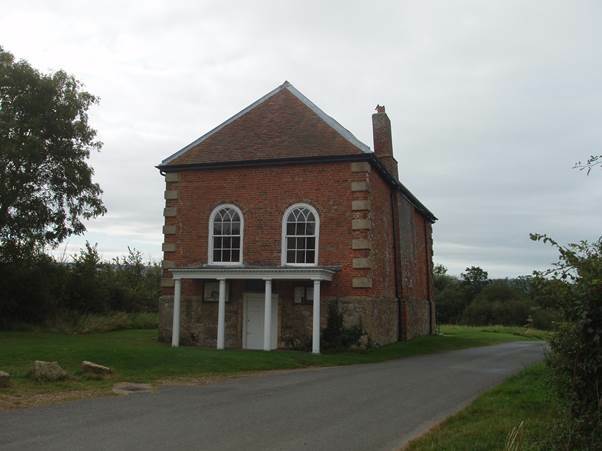 Newtown is well worth a visit, I say although I rather like it being a bit of a family secret. These photos were taken in 2005/2007. The 2007 visit marked 40 years since I first discovered the delights of Newtown. 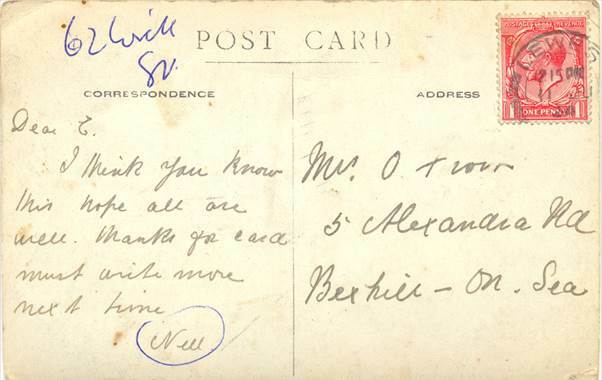 This was the address of Great Aunt Nellie and her husband Frank. 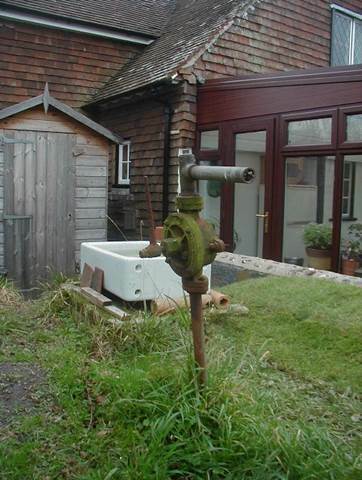 It’s an odd address for there are only a handful of houses on Wick Street which is in Firle, in Sussex. 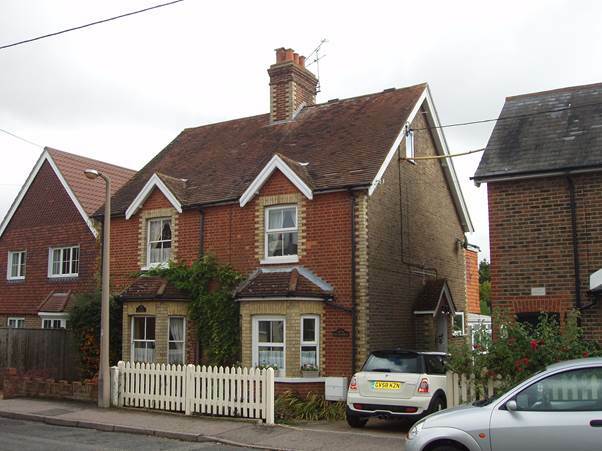 Rather, it is the 62nd Firle estate cottage and it happens to be on Wick Street. For Estate workers, Frank and Nellie did well in housing terms. 62 Wick Street was a pleasing and quite large cottage with a substatial garden. 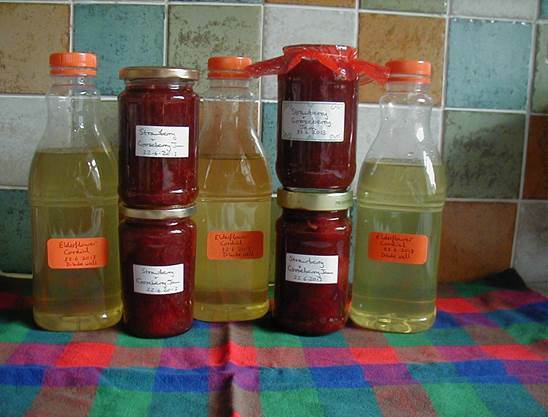 It allowed our Mr and Mrs Toms to be enterprising, finding extra ways to make a little money. Frank and Nellie married in 1905. 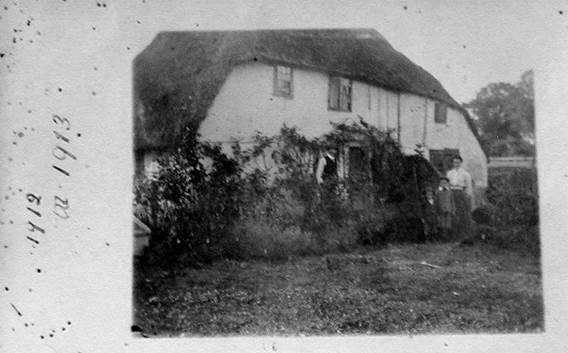 At that time 62 Wick Street was under a thatched roof. We can see this picture is captioned as 1912 or 13 and as well as the house we see Nellie with her two boys, young Frank and Arthur. 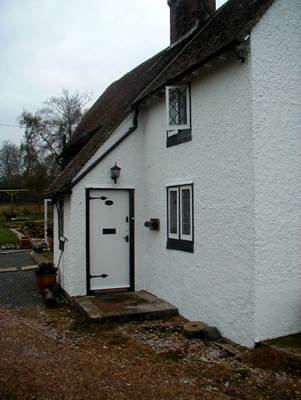 I’d guess that Frank tiled the cottage himself, when the time came. 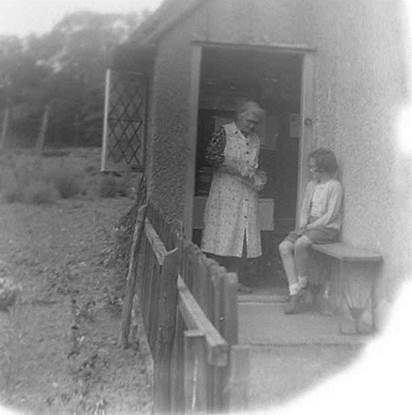 Nellie had a small shop and was able to provide teas. Wick Street was the main road from Brighton to Eastbourne so there was passing traffic. This photo of the house is actually a postcard and Nellie sent it to my Gran. That looks like Frank down near the house. I think this card was posted in 1924. The blue writing was my dad’s. Now to the 1953, the only time I remember visiting the house, for Nellie moved in with her widower son soon after, to help him with child rearing. Frank had died in 1952 so I don’t remember him. Here’s my sister being given some sweets. Nellie still had her little shop. I visited the house some fifty years later and this was the front door then. 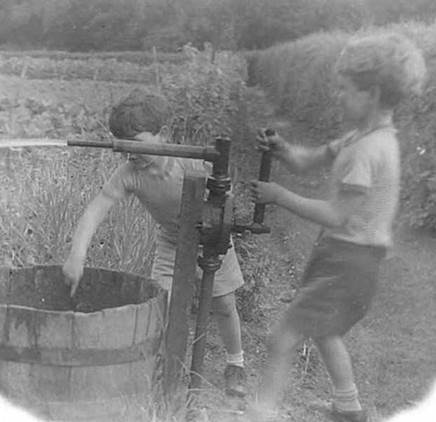 But what I really remember from that early visit was the pump in the garden. My brother and I had a whale of a time with it. Fifty years on the pump was still there, but looking a little sorry. These are happy memories of a happy home, presided over by a wonderful old lady. William Hall was a family great grandfather. He died in 1907 so nobody alive now actually knew him. There are few records, but the Cornubian newspaper did publish a report of his funeral. William was born in the Camborne area of Cornwall and as a young man he went down the mines. Like many of the Cornish miners, he tried his luck overseas and perhaps he made good. On his return to England he married and soon had a drapery business in Redruth. This is a photo taken of the microfilm reader in the Cornish Studies centre in Redruth. Considering, it really is quite clear. As a genealogy source, this gave us names to consider and other things to ponder when we first found this, back in 2002. There are absentees from that list of mourners. Where was Grace, his widow and where was our Granny who’d have been about 19 at the time? We suspect they were there, but as ‘mere women’ weren’t deemed worthy of a mention. If that’s the case I’m sure we can all be pleased that times have changed. Another alternative – more awful perhaps, is that women just didn’t attend for it was a Masonic funeral. It would be good to get a better understanding of this. Can anyone out there advise? Other names needed investigation. Dunstan, we were able to discover was the maiden name of William Hall’s mother. William Hall’s wife had been a Miss Williams before marriage. 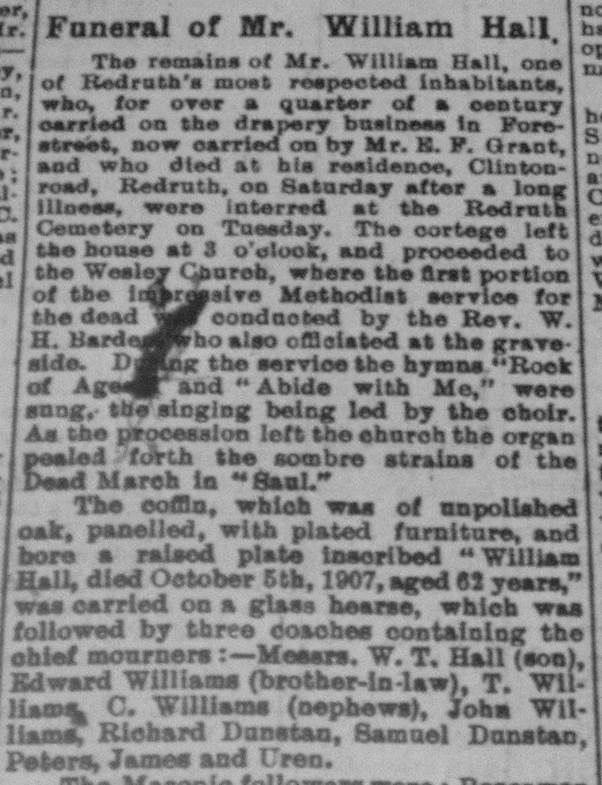 Edward Williams, as the article suggests, was her brother. 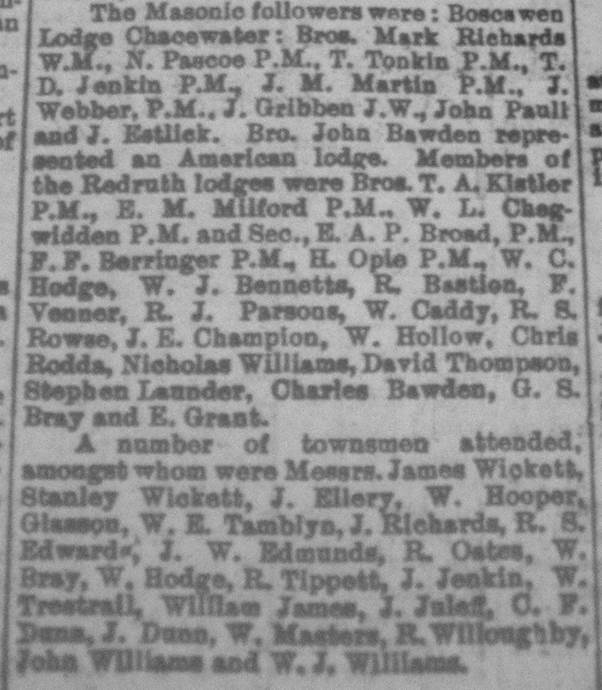 T and C Williams were the sons of another of her brothers, Christopher who died in 1900. 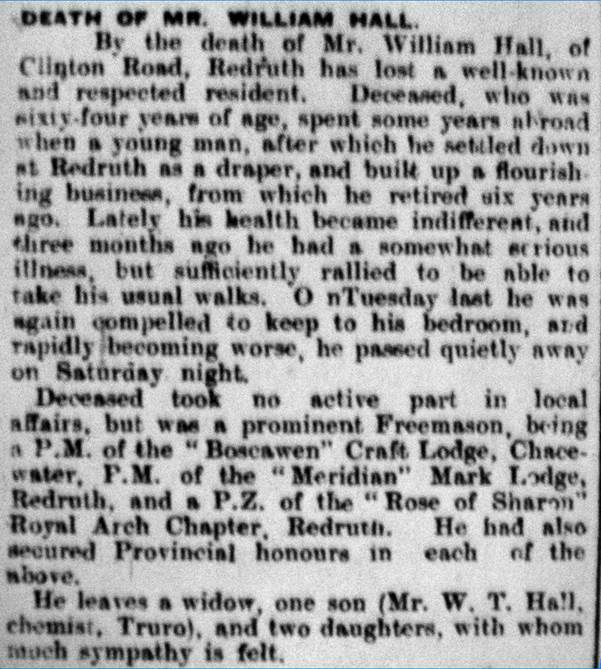 A different newspaper, The Cornish Times, recorded the death of William. At least we have a widow and daughters acknowledged. No names are given, though.